KJ Parker is one of the most impenetrable aliases in fantasy. No one even knows if the author is a man or a woman. Most fantasy and mystery authors who use initials are women because, the story goes, boys are incapable of reading books in these genres that are written by women. 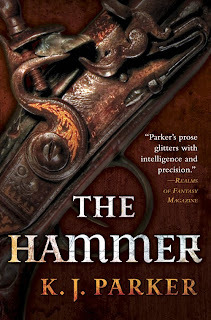 But if Parker is a woman, she hides it pretty well in The Hammer, which has hardly any female characters at all. Those that do populate the story are pretty interchangeable and don't have much personality. This is a story about men. 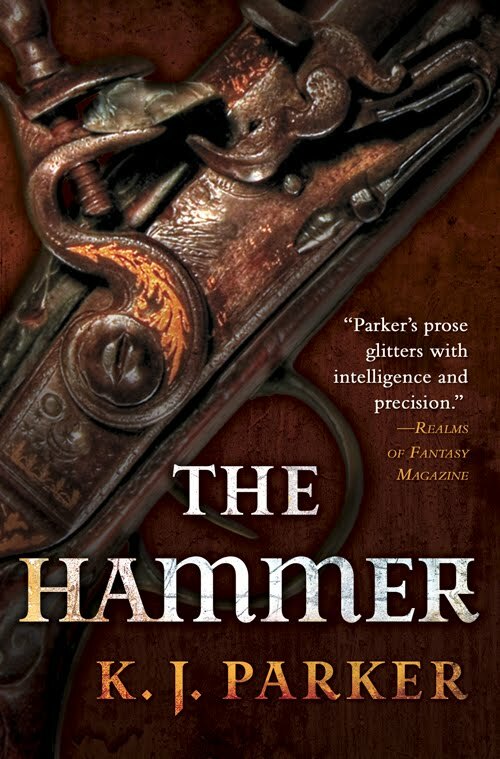 The Hammer takes place on a vast island somewhere far away from Home, the civilized world. There are colonists who live a good life on the coast, though they pay high taxes to The Company (The Company features largely in some of Parker's other novels, but not in this one.) There are aborigines, too, but they live farther away and hardly interact with the settlers, mostly due to their belief that the colonists don't actually exist except in their minds. And then there are the met'Oc, a noble family exiled to the island 70 years ago that have no money, but refuse to interact with the settlers. Instead, they live an almost subsistence lifestyle, full of pride and honor, surviving only due to their many raids of the settlers' farms. But Gignomai, the youngest met'Oc, has friends in the settlement. And he interacts with the aborigines. And he is very smart. And, for reasons kept hidden from the readers until close to the end of the novel, he despises his family and wants to punish them. These facts all combine to create a perfect storm and the island is never the same. I was pretty meh about this book the whole way through. I had really wanted to read Parker due to the author's excellent reputation with epic fantasy fans. The story is interesting and the writing is engaging, but this just didn't click for me. I didn't feel connected to any of the characters, particularly Gignomai, who seemed like a snob with too much spare time on his hands. He wasn't really that nice a person, and as we spent no time in his head, it was hard to understand anything at all about his motivations. I liked some of the other characters - Marzo the reluctant town Mayor, especially - but most fell flat for me. The key character is Gignomai, and as I didn't feel like I knew him, I didn't feel connected with any of the others, either. And so much of this story hinges on a Great Reveal. When the secret finally came out, I was surprised, yes, but it didn't floor me, and it didn't feel to me like everything that came before and after suddenly made sense. Gignomai was still just as hard to read as he had been before, except now we learn why he is so angry. I just kept flipping pages, hoping to understand what happened. And then I did find out and was underwhelmed. What should have been a very emotional scene did not resonate with me. I wonder if part of this effect is because I was reading The Ask and the Answer at the same time that I was reading The Hammer, and The Ask and the Answer is NON-STOP EMOTION. In fact, I found it somewhat manipulative with all the cliffhangers. (More on that in a separate review.) But perhaps because of all the emotional roller coaster-ing with the one book, I just had nothing left for this one. Just in case that's true, I'm going to give Parker another try - just not sure when or which book to try! The Hammer is a bit of an odd book but if I may recommend Aarti, try The Folding Knife by KJP. Its her best book and one which is the most accessible as well. I agree it is very hard to like a "regular" book if you read it too close to reading or having read a FABULOUS book! And I often wonder too if I would have felt differently but for the temporal proximity of the two experiences! Ooh, good use of the phrase "temporal proximity." I'm impressed! I found everything dull for a while after the Ness, too. Yes, I thought since I didn't fall in love with Chaos Walking like others did, it wouldn't impact me, but it IS emotionally exhausting. It's so hard to read a book that you just feel "meh" about all the way to the end, and when the big reveal happens, it's nothing to write home about. I find sometimes that after I have read a great book, I tend to be underwhelmed by the next few, unless, they too, are amazing and wonderful. I'm sorry this one didn't work out for you. I am glad that you are giving the author a second chance though! Yes, I think s/he deserves at least one more go from me, and maybe for me to try one of the more popular books! I just do not know, it makes me feel very..no. The first Parker book I ever read was Purple and Black, and I liked it a lot. It's not earth-shattering, but it was an excellent first KJ Parker book. In case you want to try another one. I like it when authors are mysterious like that, it adds to the suspense! It's a shame you didn't enjoy this book as much as you had hoped. Pity is was dull, the premise sounds really good with opportunities for various developments. Not-brilliant reveals tend to make you feel you've been reading for less than you'd thought, disappointing. Ugh, protagonists that are not likable are the worst. But perhaps your other read did indeed have something to do with it and another Parker book will turn out to be pretty ok? How interesting! I didn't know about the mystery behind their identity. I bought a copy of one of their books at the sci-fi store on a browse once, but I haven't gotten to it yet; I hope the enjoy that next of theirs that you try (more than you enjoyed this one).